The first trailer for Avengers: Infinity War has finally dropped and it's even better than fans were hoping for, which is a huge feat. 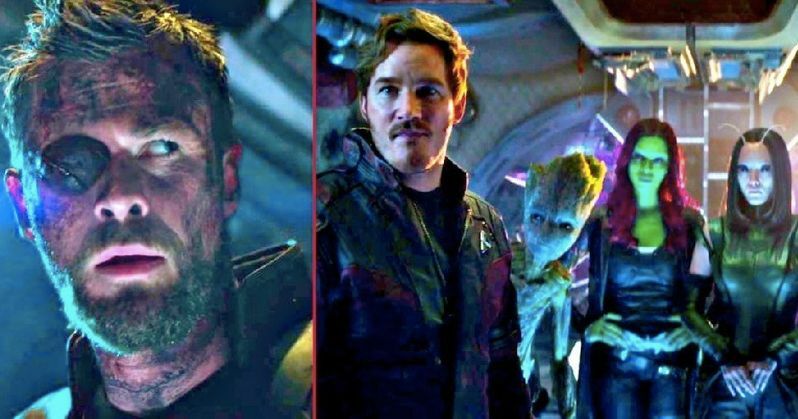 The trailer ends with Thor waking up and meeting the Guardians of the Galaxy on the Milano, which has led to questions about how they end up meeting in the first place. A deeper dive into the trailer as well as some notes from the footage that was shown over the summer at the D23 Expo and San Diego Comic-Con may solve the mystery of how the Guardians of the Galaxy join ranks with the Avengers in Infinity War. In one of the post-credit scenes for Thor: Ragnarok, we see Thanos' ship showing up over the top of the Asgardian ship. The feeling is unsettling, especially after the triumph over Hela as well as Thor and Loki getting along. But the Infinity War trailer shows what more than likely happens next. Loki was seen grabbing the Tesseract, which contains the Space Stone, from Odin's Vault before Asgard is completely destroyed in Ragnarok and is shown in the new trailer handing the Tesseract over to what we can only assume is Thanos. To figure out the rest, we need to look back at the now mythical footage of Infinity War that was shown over the summer. The footage showed Thor flying through space after an encounter with Thanos, wounded and unconscious. The same footage shows Thor hit the windshield of the Milano, which brings us to the new Infinity War trailer. At the very end of the new trailer, The God of Thunder wakes up on the Milano, confronted by The Guardians of the Galaxy. Star-Lord, Gamora, Drax, Rocket, Groot, and Mantis are seen examining the strange beaten up one-eyed man. From there, the new acquaintances will head to Earth to reunite Thor with the Avengers and battle against and stop the Mad Titan, who just so happens to be Gamora and Nebula's father, from acquiring all of the Infinity Stones. Strangely absent from the new trailer for Infinity War is Nebula, which may mean that we're in for some surprises when she shows up. In the Infinity War comics, Nebula has a large part to play, but it is unclear how the Russo Brothers have decided to utilize her in the upcoming Avengers 3 and Avengers 4. Whether the trailer is any indication of how much Guardians of the Galaxy are in Infinity War is anybody's guess at this point in time since the real waiting game starts now. Marvel did a wonderful job ramping up the hype and excitement for what has been hailed the end of the MCU as we currently know it and Marvel fans can't get enough of it. While the footage from over the summer has still yet to be released, you can check out the trailer for Infinity War below, courtesy of Marvel Entertainment's YouTube channel and watch the Guardians of the Galaxy meet The God of Thunder.